Blood thinners have been around since the mid-1900s. Although the name is misleading — they do not actually “thin” the blood — they effectively prevent blood clot from forming in patients at high risk for diseases of the heart and blood vessels. Blood thinners can lead to serious, potentially life-threatening bleeding. Doctors often prescribe blood thinners to people with existing health conditions that affect the heart and blood vessels, as well as those who are at a greater risk for such conditions. Blood thinners can also be prescribed after some surgeries, such as hip or knee replacement surgery. Blood thinners can prevent clotting and stave off growth of existing clots, but they are not without risks. Bleeding is the primary risk associated with blood thinners. This potential side effect can be mild or serious, ranging from bruising to hemorrhagic stroke, bleeding in the brain that requires emergency care. Patients taking blood thinners should always defer to their doctors about the risks and benefits of the prescribed medication. It is also wise to take blood thinners exactly as prescribed to avoid any unnecessary risks or side effects. Blood thinners are medications used to prevent blood clots from forming. They can also keep existing clots from getting larger and blocking more blood flow through the body’s vessels. These medications, when used correctly, prevent blood clots, heart attacks, strokes, and other heart- and blood vessel-related complications. The two main types of blood thinners are anticoagulants, which include warfarin and heparin, and antiplatelet drugs, such as aspirin. When Are Blood Thinners Prescribed? Blood thinners are prescribed to treat a variety of health conditions that can cause blood clots. Clots that form in the arteries, veins and heart can lead to heart attacks, strokes and blockages that can cause other health problems. Signs and symptoms of blood clots include swelling, warm sensations, inflammation or redness, pain or tenderness, and skin discoloration on the surface of the skin of the affected area. These symptoms may vary or become worse when the clot forms deeper in the veins, a condition known as deep vein thrombosis (DVT) or travels to the lungs, resulting in a pulmonary embolism (PE). If the clot affects other parts of the body, such as the heart, kidneys or brain, symptoms can include chest pain, shortness of breath, headaches, and dizziness. Atrial fibrillation (AFib) is a type of irregular heartbeat that is often treated with blood thinners. People with this condition are five times more likely than those without AFib to suffer from a stroke. Patients with AFib who have a stroke are also more likely to experience permanent disability. Blood thinners do not actually “thin” the blood. Instead, they keep the blood from getting thicker and work to reduce a person’s risk of forming blood clots. Blood thinners do not dissolve or break up existing clots. But they can prevent existing clots from getting larger. Blood thinners work in different ways. Some act by blocking or weakening vitamin K and its blood clotting effects. Others block proteins or enzymes that bind blood cells and platelets. One type of blood thinner also works to keep platelets from sticking together or to the walls of blood vessels. There are a variety of blood thinners, both new and old, that fall under two categories. The first group of blood thinner medications is called anticoagulants. “Anti” means against and “coagulant” means to thicken into a gel or solid. Coagulation is the process of blood clotting. Warfarin is an anticoagulant blood thinner. 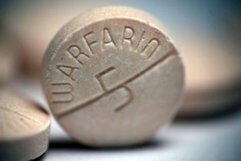 Warfarin is an anticoagulant blood thinner that has been around since the 1950s. Despite the fact that newer blood thinners are now on the market, the U.S. Food and Drug Administration has estimated that approximately two million people still take warfarin. But even with the continued popularity of the tried-and-true anticoagulant, a newer class of blood thinners has been introduced in recent years. Pradaxa, Xarelto and Eliquis are among the blood thinners approved by the FDA since 2010. Anticoagulants slow the body’s process of making clots by targeting clotting factors — proteins thrombin and fibrin — and vitamin K.
Hep-Lock is a fast-acting liquid medication administered by injection. It prevents the blood-clotting proteins thrombin and fibrin from working to form clots. This injectable blood thinner is also made from heparin but produces a more predictable anticoagulant response. This means it does not require the close monitoring needed with heparin. Patients can therefore administer the medication at home themselves. Pradaxa, which hit the market in 2010, belongs to a newer class of blood thinners. Taken by mouth, the anticoagulant works by inhibiting the clotting effects of the enzyme thrombin. Approved in 2012, this blood thinner belongs to the same class of oral medications as Pradaxa. Eliquis acts on an enzyme — Factor X, or Xa — that plays a role in the production of thrombin. Xarelto was approved in 2011. It also blocks Xa. There is currently no antidote for this medication. Coumadin is the oldest of the blood thinners. Warfarin’s discovery began in the early 1920s with mysterious hemorrhaging cattle and ended with the development of an anticoagulant medicine that blocks the formation of vitamin K-dependent clotting factors. Its antidote is vitamin K.
Antiplatelet drugs are the second group of blood thinners. Platelets — also called thrombocytes — are a component of the blood that stops bleeding by clumping together in blood vessel injuries. Antiplatelet drugs prevent platelets from clumping together to form a clot. Many of these medications act on receptors, proteins that receive chemical signals and cause cells to bind, to achieve this effect. These drugs are not as strong as anticoagulants. For this reason, they are not often prescribed to patients with existing blood clots. Instead, they may be used to treat individuals who are at risk of blood clot formation. This antiplatelet drug reduces the number of platelets in the blood, thereby limiting their ability to clot. This medication works by binding to the P2Y12 receptor and inhibiting platelet function. Its effects are irreversible. This antiplatelet drug interacts with the P2Y12 receptor to keep platelets from sticking together. Its effects, unlike those of Effient, are reversible. This medication stimulates the production of a group of fatty acids collectively called prostacyclin. This stimulation helps to block platelet activation. This medication prevents platelet activation by interacting with adenosine diphosphate receptors. Aspirin blocks a blood-clotting chemical called thromboxane. This medication is sold under various brand names, such as Aspir, Ecotrin, Bayer and Easprin. Aspirin is often given to people experiencing a heart attack because it can quickly and powerfully inhibit platelet activity and the growth of the blood clot, thereby maintaining some measure of blood flow. Studies show that chewing the tablet has a faster effect than swallowing it. Natural blood thinners are any non-medication sources that slow or prevent blood clotting. These might include alcohol and certain foods and herbs, such as garlic, ginger, celery seed and aniseed. Even water can naturally thin the blood. Dehydration causes the blood to thicken, which can lead to an increased risk of clots. So drinking plenty of water can be good for cardiovascular health. If you are taking blood thinner medications, you should check with your doctor before taking herbal supplements. Combining blood thinner medications with natural blood thinners can result in an increased risk for bleeding and other unwanted side effects or complications. Foods, herbs and spices, and oils containing high amounts of vitamin E, salicylates, natural antibiotics or omega-3 fatty acids have natural blood-thinning properties. On the flip side, foods high in vitamin K can lead to blood clotting. This can also affect the way your blood thinner medication works. Foods rich in vitamin K include leafy green vegetables, saturated fats, and cultured foods with live bacteria. If you are already taking a blood thinner medication, you should talk to your doctor about any dietary concerns. Alcohol may interact with blood thinners by either decreasing or increasing the anticoagulation effects of the drugs. For example, people who drink while taking warfarin may be at risk of excessive bleeding because alcohol can enhance the anticoagulation effects of the drug. Alternately, chronic drinkers may metabolize warfarin more quickly, causing them to need a higher dose for the same therapeutic effect. Either way, warfarin and alcohol are a dangerous mix. Possible side effects of Xarelto and other blood thinners include uncontrolled internal bleeding, bruising and rash. Internal bleeding, or hemorrhaging, is an emergency condition that requires prompt medical attention.